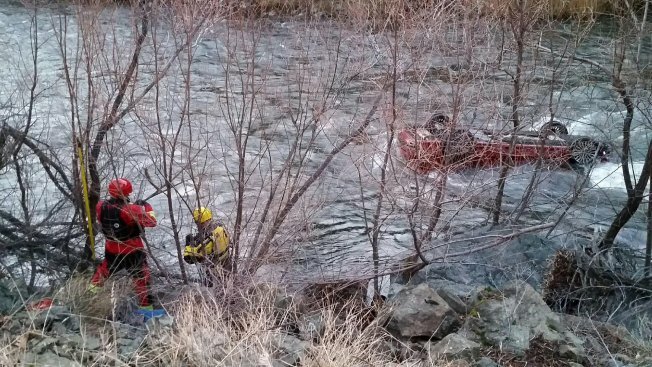 A man survived for hours trapped in a car after it plunged into the Klamath River in Northern California. A man survived for hours trapped in his upside-down car after it plunged into a frigid Northern California river, officials said. California Highway Patrol officials in Yreka said 28-year-old Michael Finn breathed from a pocket of air inside his vehicle until he was rescued five hours after his car skidded off State Route 96 into the Klamath River in Siskiyou County. The office says that a Siskiyou County Sheriff's dive team and a tow truck pulled the car from the water. "I'm still in disbelief that he was still alive," dive team commander Sgt. Robert Giannini told NBC affiliate KOBI. Authorities say Finn was transported by ambulance to a hospital to be treated for exposure.